LONDON FASHION WEEK - Days 3 & 4. Can you believe that it's London Fashion Week 2012. It's come around so quickly. LFW is showcasing some of the A/W 2012 trends, what colours, materials and structures are meant to be in trend once Spring & Summer come to a close. Below you will see a range of different designers listed who showed their pieces on either Day 3 or Day 4 of London Fashion Week. Obviously more designers then the ones i've listed were there, but these are some of my favourite designers based on their pieces for A/W12. From all their pieces i've picked a few of my favourite pieces from their that were shown during LFW and created these collages. 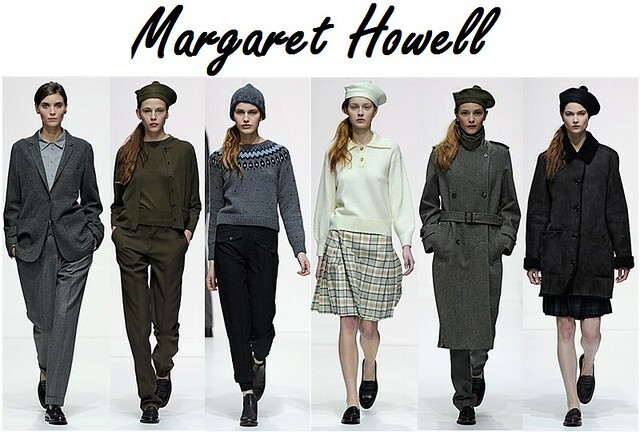 About: The Designer has used her own name as the name for her company, behold Margaret Howell, who is a woman orginally from Surrey in England. Her Label is all about providing enduring quality and contemporary clothes for both Men & Woman. She says that her inspiration for this Autum Winter 2012 is that of a frozen English landscape, Shetland ool and Traditional fabrics with Modern constructions. The Trademark pieces for this Collection are a White Cotton Shirt, an Unstructured Tweed Jacket, a Garbadine Raincoat and the Flat Leather Lace-up Shoe. 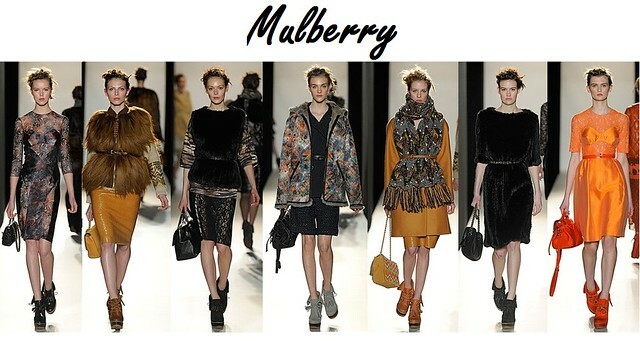 About: Mulberry does not have a single designer but the Creative Director for Mulberry is Emma Hill. She says the highlight of her career was when Mulberry won Designer Brand of the Year Award at the British Fashion Awards in 2010. Mulberry's Trademark pieces in the part have been that of the well-known Bayswater and the Alexa. This season though the Trademark piece is all about our 'new families' they're keeping it very secretive though!! You can view the Mulberry Lookbook here. About: Marios Schwab has also used his own name as the name of the company, to be fair though, his name is very out of the ordinary, so it works! Marios is orginally from Austria, but is currently living in London. Before starting up his own business Marios Schwab used to work for the Menswear Designer Kim Jones on Jones' Womenswear Label. He says his Trademark Piece is that of a Seductive Little Dress and his Three pieces of Inspiration for the A/W12 Collection is Eau De Nil, The Portrait of a Lady and a No.5 in C Sharp Minor by Gustav Mahler. Marios Schwab also has a new line launching in September 2012. About: Vivienne Westwood is a worldwide, well known Designer who is originally from Glossup in Derbyshire. She has one plenty of awards such as the title of British Designer of the Year in 1990 and The Outstanding Achievement in Fashion Award in 2007. The adaptation of historical garments construction into Modern lothing is the Design Style that Vivienne is trying to achieve with her pieces. To seek ideas on a new upcoming Collection Vivienne Westwood will venture out to Museums and Galleries and will also look at Books, Paintings, Culture and Classical Music. 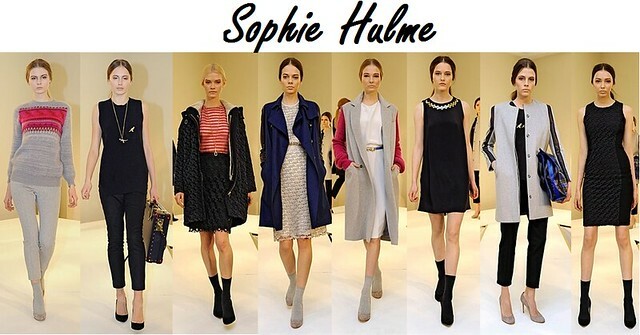 About: Sophie Hulme the Designer of 'Sophie Hulme' is originally from London and set up her label 2 months after graduating from University. Her price range at Retail price is from between about £200-£800 and she tries to make all her pieces unique yet still wearable. The trademark piece for this is The Outerwear in general because it is very popular. The armoured tote bag has had to be re-run a couple of times due to so much attention being paid to it. About: The designer director behind this label is Alistair Carr who joined the designing team in 2011. The design signatures of Pringle of Scotland are clean, modern and active. Alistair's personal design heros are his Grandfather, Azzedine Alaia and Nicolas Ghesquière. 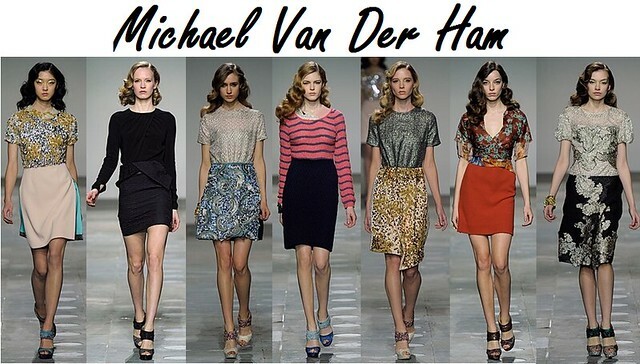 About: Michael Van Der Ham is orginally from The Netherlands,and has worked at Sophia Kokosalaki and Alexander McQueen. He says that he likes to mismatch different references in each item of clothing and that his trademark piece is Knitwear with chiffon tops and multi-fabricated dresses. His Autumn/Winter 2012 inspirations are special and unique fabrications, intricate cuts and custom-made textiles. 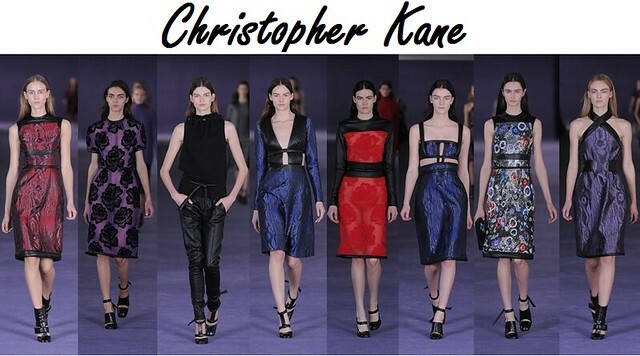 About: Christopher Kane is a designer whom is originally from Scotland and set up his own label as soon as he graduated from University. He loves incorporating fine detail into his pieces and loves embelishment as it can transform a garment imediatelly. He says that 2012 is going to be an exciting time for his label as they are really working with growing as a business and the bredth of their collections. About: The cheif creative director of Burberry is Christopher Bailey and he is responsible for the design of all the collections and products. 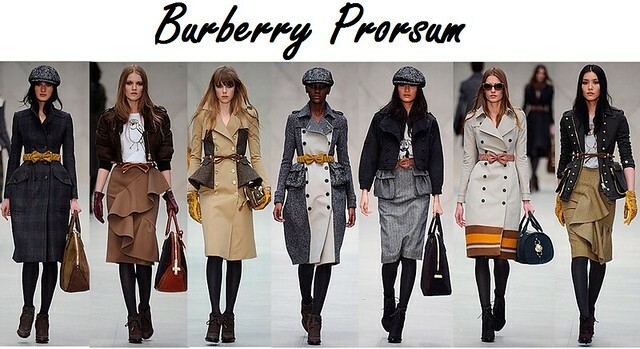 In 2008 Christopher Bailey set up the Burberry Foundation with Burberry Chief Executive Angela Ahrendts. The Burberry Foundation is committed to dedicating global resources to help young people realise their dreams and achieve their goals and potential through their power and creativity. About: Giles Deacon, the designer behind Giles and was awarded 'Best New Designer' in 2004 at the British Fashion Awards and in 2006 he was awarded with 'British Designer of the Year' at the British Fashion Awards! His design signatures are playful, statement and confidence-giving clothes. The National Gallery and The National Portrait Gallery are great sources of inspiration for his 2012 Autumn/Winter Collection. So here are some of my favourite pieces from the Designersm who showcased their collections on Days 3 & 4. Marios Schwab, Vivienne Westwood Red Label, Sophie Hulme, Michael Van Der Ham and Burberry Prorsum were collections that really stood out for me. They've all got some really gorgeous pieces in their collection for the upcoming A/W. We've seen a lot more brighter colours in Days 3 & 4 as oposed to the simple colours on Days 1 & 2 of LFW. Vivienne Westwood's Red Label collection really stands out to me for this due to how colourful it is, and you can see it's quite obvious that she gets her inspiration from art. I'm a fan of the belt over the coat in the Burberry Prorsum collection, it's a shame that that look took over the majority of the collection and is obviously the signature piece, but it does look absolutely great. But would be such a pickle to get off, would take you a good while. Sophie Hulme, Michael Van Der Ham and Marios Schwab's collections are all very different but have that similarity about them. I can see pieces very similar to those in the collection being in local highstreet stores during Autumn/Winter 2012. The patterns, yet effective are very simple, hence what makes them such great pieces. I'm really happy with what these designers have designed, gorgeous pieces. All the designers that showcased their collections on Day 3 and Day 4 of London Fashion Week are as follows.. Margaret Howell, Mulberry, Nicole Farhi, Craig Lawrence, Twenty8Twelve, Marios Schwab, J.W. Anderson Woman, Vivienne Westwood Red Label, Thomas Tait, Peter Pilotto, Antonio Berardi, Sophie Hulme, Pringle of Scotland, Christoper Kane, Michael Van Der Ham, Erdem, Fred Butler, Mark Fast, Burberry Prorsum, Fashion East, Giles, Osman, Christian Blankmen, McQ Alexander McQueen. What do you think of London Fashion Week midway through? Are any Designers, Collections or Pieces really standing out for you? See our coverage of both London and New York Fashion Weeks @Motilo. Shop together and create your ultimate look.